The production was originally created and directed in a ground breaking, integrated style when first shown in 1984. 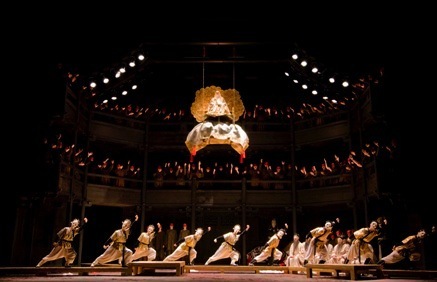 It opened the Royal Opera’s season at the Olympic Arts Festival in Los Angeles to rave reviews and has had a total of twenty-two revivals worldwide. Apart from the many London revivals, and an expansion for Wembley Arena, the production has been seen in Los Angeles, Seoul, Tokyo, Parma, Cagliari, Lisbon, Madrid and Washington DC. The choreography for the ten masked dancers draws on the T’ai chi Chuan, other martial arts and Western contemporary dance. The singing roles of Ping, Pang and Pong are enhanced by their action and gesture in the style of Commedia del Arte.There is also a group of masked actors who are integral to the staging with the singers and dancers. The working process of making the choreography for the original production was unusual. I worked with the dancers for ten days before Serban arrived, devising dance material and sequences which were then used in the staging of the work. It is hard to draw the line between his work and mine and the seamless nature of the production is very special. There is also about an hour of choreography and movement in the whole. Act I is particularly strong in the way the staging dovetails together the actors, dancers and principals to tell the story. In 1984 choreologist Ann Whitley assisted me and she wrote the Benesh notation score, which has been used in all subsequent revivals. Tatiana Novaes Coelho used this Benesh score for the recent London revival when it returned once again to the Royal Opera House opening the 2013-14 season. It has been screened internationally in over 1000 cinemas. There was a superb cast and at interval presentations featured the movement element significantly. The previous revival was in 2009 with Washington National Opera at the Kennedy Center. It was a wonderful experience to work with the singers, American dancers and supers and to reconnect with director Andrei Serban. My assistant was Tatiana Novaes Coelho and Assistant Director was Crystal Manich. We had a five star stage management team making the whole production a joy to recreate. The last performance there on June 4th 2009 was conducted by Placido Domingo, who was Calaf in this production in 1984. Serban’s point is that the Forbidden City is very much in love with death; it celebrates death. And so revival director Jeremy Sutcliffe rolls out the ceremonial, exotic masked dancers caught in the sensual slow motion of Kate Flatt’s choreography, gliding like spectres across the arena of death while the populace roar their approval from the terraces of Sally Jacobs’s still striking set. An extremely successful feature of the production was the dancing, choreographed by Kate Flatt. The director has hereby solved a problem with opera in general and Puccini in particular, which is that there are long musical intervals in which a large discretion is left to the director to decide what is to happen on stage while they unfold. In this production dance provides the solution, and it works wonderfully well. It is an idea worth exporting generally. It interprets the music and advances matters both atmospherically and narratively, at the same time maintaining or heightening tension as needed, and holding the audience.